Twenty-five years on, the legacy of the Oka Crisis for many of those who experienced the tension west of Montreal is a greater awareness of indigenous issues. 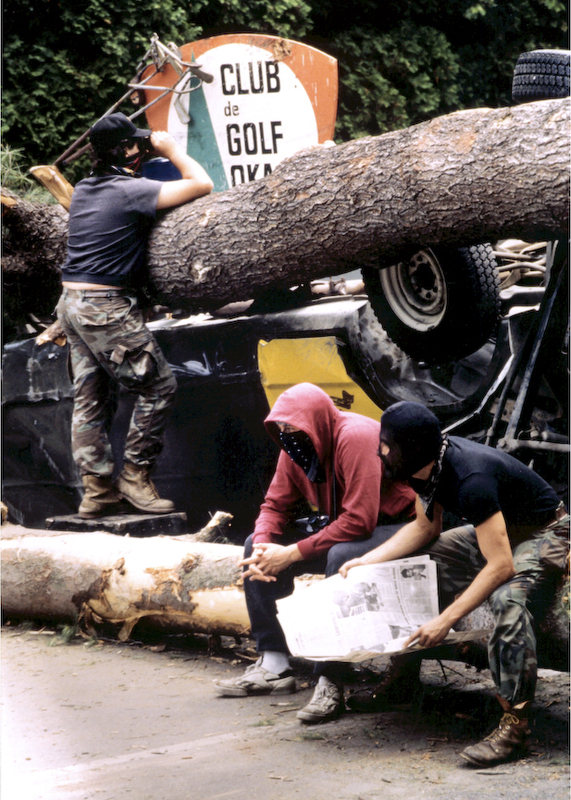 In 1990, when the town of Oka decided it was going to allow the expansion of a golf course on disputed territory —including on a Mohawk burial ground — people living in the neighbouring Mohawk community of Kanesatake rose up in defence of what they said was their land. In response to the council’s decision, Mohawks barricaded a dirt road leading to the golf course. After they refused to obey a court injunction to stand down, a shoot out ensued with provincial police officers and resulted in the death of Cpl. Marcel Lemay on July 11. Where the bullet came from remains a mystery. The Quebec government called in the Canadian Forces and roughly 800 members of the Royal 22e Regiment encircled the Mohawks in the pines with barbed wire. 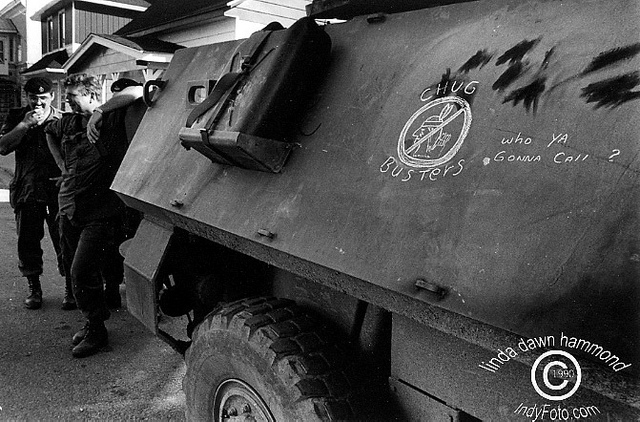 Racist graffiti on the side of an armoured personnel carrier used by Canadian military at Oka, 1990. Photo by Linda Dawn Hammond. “[Premier Robert Bourassa] called us into his office the day after (the shooting) and told us — he made it clear, he didn’t want any more death,” Sam Elkas, who was the Quebec public security minister at the time, said in an interview. After 78 days of negotiations, both sides struck a deal: the barricades made of dirt and mangled police vehicles were to come down in return for the cancellation of the golf course expansion. The disputed territory remains an unsettled issue, however, and was never officially ceded by the Mohawks or handed over to the Kanesatake by federal or provincial governments. “You reach a point after a while where you have to make a stand,” Kanesatake resident Linda Simon, who experienced the violence, said in an interview. The 1990 events led to the Royal Commission of Aboriginal Peoples, which helped usher in new agreements between indigenous and non-indigenous people such as the resource-sharing deal in 2002 called the Paix des Braves (Peace of the Braves) between the Quebec government and the Grand Council of the Crees. Alanis Obomsawin, an award-winning filmmaker who made a much-praised documentary about the conflict called “Kanehsatake: 270 Years of Resistance,” said the events of 1990 inspired indigenous people across the country and raised awareness among Canadians regarding land claims. Back home, Quebec Aboriginal Affairs Minister Geoffrey Kelley said provincial and federal governments have appreciated since Oka that First Nations groups need to be consulted when development projects affect their territory. “Back then I think we would have acted more unilaterally,” he said. Kelley mentioned provincial funding for the Kateri Memorial hospital on the Kahnawake reserve south of Montreal — which he said required several bureaucratic hurdles to overcome such as modifications to labour laws — as an example of a change in government attitude toward Indigenous Peoples. “It’s a small example but a good one to show how we are adapting our institutions with native realities and I think they will bring great benefits in the future,” he said. But while indigenous people have received more respect from non-indigenous governments since Oka, there are many outstanding land claims across the country, and some Canadians still harbour prejudices against Aboriginal Peoples, Kelley said. Tom Siddon, federal minister of Indian Affairs and Northern Development at the time under Brian Mulroney, said he believes Oka played a key role in improving the thorny issue of land claims. “I think we were able to make some major progress and I do believe that Oka was an important turning point in our natural history,” he said in an interview. Serge Simon said it has taken a generation for people to overcome the trauma of the crisis and band council politics have only recently started to calm down after years of tension and sometimes violence between community members. human-rights abuses he alleges his people suffered at the hands of the provincial police. “[The provincial police] took my cousin Angus Jacob and brought him to the back of a barn and handcuffed him to a metal chair,” he said in an interview. He said events like Oka can happen again in Canada but it’s critical that indigenous and non-indigenous people continue to talk to one another. “Oka is what happens when dialogue stops,” he said. Posted on July 8, 2015, in Defending Territory, Warrior and tagged armed standoff, Indigenous armed resistance, Indigenous resistance, Kanien’kehá:ka, Mohawk, native blockades, native resistance, Oka, Oka Crisis. Bookmark the permalink. Leave a comment.